You'll be £16.99 closer to your next £10.00 credit when you purchase Last Boat from Dunkirk. What's this? Last Boat from Dunkirk gives viewers the special privilege of joining a group of elderly veterans on an emotional pilgrimage - to the scene of the world's most famous wartime evacuation. Our cameras will be with them as they return to pay their respects to the brothers-in-arms they lost, while re-living those dramatic memories of the famed Operation Dynamo, which began at Dunkirk on May 27, 1940 . They will share with the viewer all the personal memories, nightmares and experiences which remain with them today. The veterans – frail yet proud - will defy age and ill-health in order to visit Dunkirk once more. They do so to mark the point in time and history where so many of their fellow countrymen made that ultimate sacrifice, in the devastating Battle of Dunkirk and the desperate evacuation that followed. The storyline of the documentary will be one of celebration – for the 338,000 soldiers who were rescued from German capture by the heroic flotilla of 850 small boats; and also one of commemoration, for those who didn't make it back alive, and those who were left behind as POWs – one in eight of the retreating men. The nation would herald Dunkirk as 'disaster turned to triumph' and the spirit evoked in the determined mission to rescue stranded soldiers has since become part of the English language. 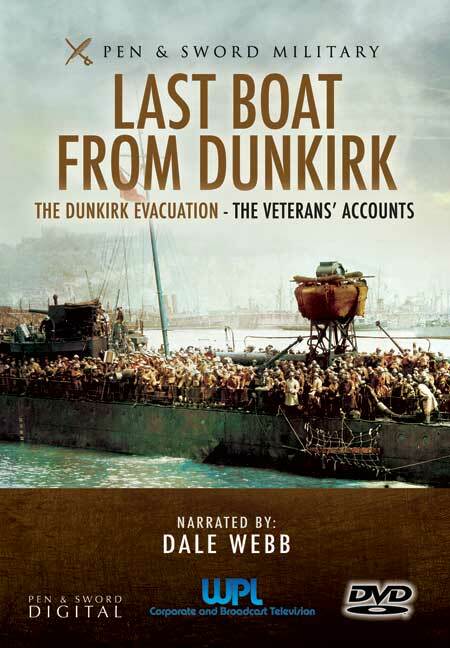 Last Boat from Dunkirk will bring that spirit to life, in the form of each and every one of the veterans featured in the programme. The film will see the men – now rapidly dwindling in number - visiting key sites, leaving floral tributes, taking part in emotional memorial ceremonies, and generally reflecting on that long-ago journey with their own kind of quiet dignity. They'll be meeting up with old comrades - and sometimes old adversaries - to look back together at what really happened at Dunkirk, how it affected them, and how the campaign changed the course of World War Two. Their rescuers too will be represented, as they recreate the sequence of events which saw the soldiers wade neck-deep into the sea and wait hours to be lifted aboard. A flotilla of boats gathered for the occasion will recreate the scene which greeted the servicemen. After the ceremonies are over, the men will share with each other the tales of bravery, danger and constant threat which marked that conflict. In witnessing these exchanges, we'll learn what really happens at war, behind the headlines and history books. Historians can provide an over-view of a campaign and the events leading up to it, and the events have been the subject of films, book and TV series over the years. However, it's only the people who were actually there who can give the personal, ground-level perspective of what happened, and why. In telling their story, we'll also see genuine archive TV footage of the conflicts, along with personal photos which are part of the men's private collections. Photos taken during the conflict will provide a stark illustration to their stories. The film will outline who among them did what, and ask them to explain in their own words exactly why they did it. From personal accounts of fear and chaos, through to uplifting stories of brotherhood forged in adversity. This is the campaign which narrowly averted a surrender to Hitler....in the words of those who were actually there.